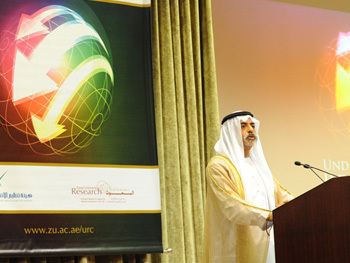 The College of Information Technology at Zayed University hosted the Third Annual Undergraduate Research Conference on Applied Computing (URC 2011) on May 4 â€“ 5 at the Dubai Campus. The Undergraduate Research Conference on Applied Computing (URC) in an initiative developed by Qusay Mahmoud from the College of Information Technology, to engage undergraduate students into applied research to inspire them to work hard on things that matter to them, their society, and the rest of the world. Today, the objective is to provide a platform for students to present their research and interact with other young researchers and leaders from the IT industry from the region. To this end, it is a conference about students and their research. 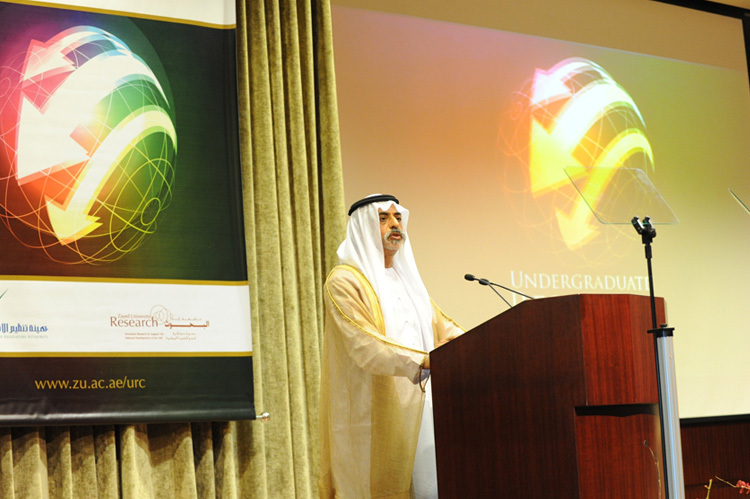 His Excellency Sheikh Nahayan Mabarak Al Nahayan opened the conference and delivered a keynote speech in which he stressed on the importance of research, development, and innovation in building a knowledge-based economy. He laid out a couple of principles going forward: to engage students into faculty research activities, and to provide them with the necessary mentoring and guidance to enable them to excel in their selected areas of research. After his keynote speech, H.E. took the time to talk to the students about their research projects. 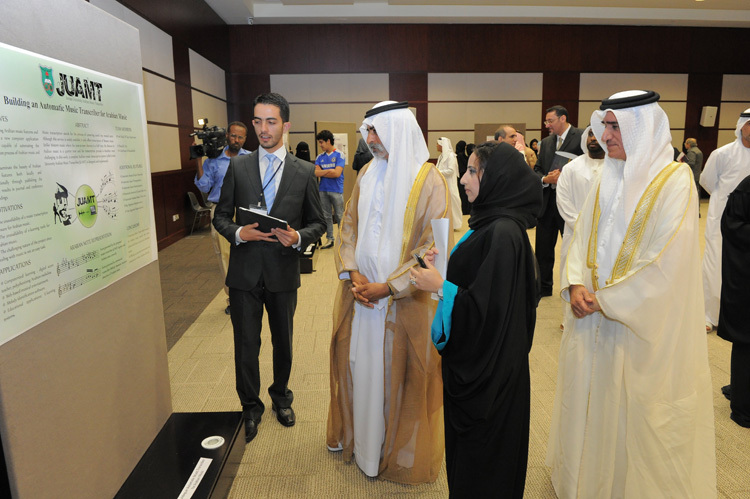 More than 120 research projects were presented in oral and poster formats from academic institutions in the GCC and other Arab countries including, UAE, Saudi Arabia, Oman, Bahrain, Qatar, Jordan, Egypt, Lebanon, and Palestine. The book of abstracts is available online here, and hard copies are available at the Business Centers. At the awards ceremony, a total of 10 awards were presented to the students of the best five in oral and in poster presentations. More information about the selection process, winning projects, and photos from the awards ceremony, please see here. 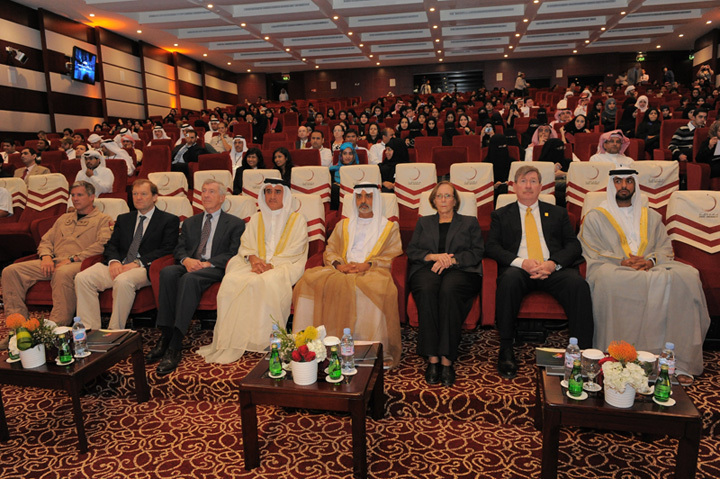 Overall, the conference was very successful and excellent feedback has been received from participants in the region. Thanks to the financial support of the Telecommunications Regulatory Authority (TRA) and the Office of Research at Zayed University. Special thanks to the organization committee for their hard work and dedicated service: Qusay Mahmoud and Leon Jololian (Conference Co-Chairs), Zakaria Maamar and Abdallah Tubaishat (Program Co-Chairs), May AlTaei (External Relations Chairs and Publications Co-Chair), Mona Bader (Registration Chair), May El Barachi (Publicity Chair), Nagaraj Chandrashekaran (Awards Co-Chair), and Huwida Said, Mario Guimaraes, Hind Al Dosari, Arwa AlNuaimi, and Izzedin Asad (Local Arrangements). Many other people have contributed to the success of this yearâ€™s conference, including dedicated individuals from the VP office, and other faculty, staff, and students. It wouldnâ€™t have been possible without you! Thank you for reading this far and we look forward to your support and involvement in URC2012, which will be held at the Abu Dhabi Campus.